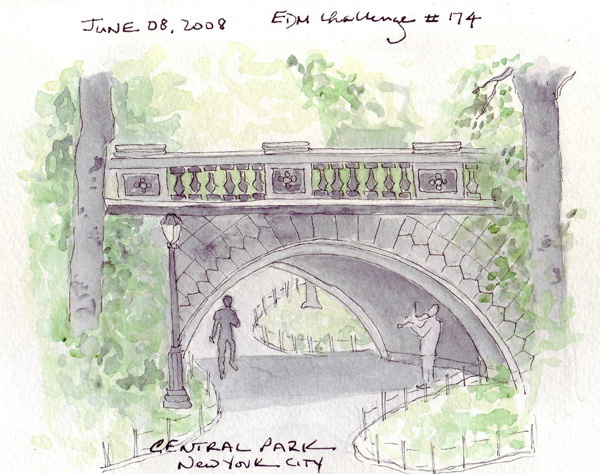 I was able to photograph and sketch a small foot bridge in Central Park, New York City. Landscapes aren't "my thing" so I need to be forced to consider trees and bushes. I missed several EDM Challenges when I was on vacation in Quebec. This sketch of an inuit piece of jewelry was finished this week from memory. The background pink color was my addition - the Inuit pin was just the ice cubes, figure, and base. Wow, I like that bridge. The shadows are great, you really get the shapes of everything. Lovely. Great bridge, and I like the musician you included. THe inuit image is really neat--so simple and economical. 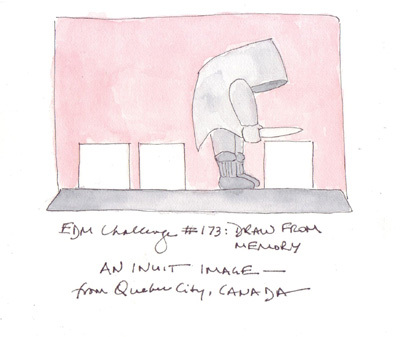 I just browsed your blog....what great journal sketches from Quebec! I also enjoyed the photos of you sketching. Someday I hope we can do that together!!! This bridge sketch is awesome. I love your NYC sketches the best I think. Maybe because it's your city and you know it so well? Maybe because I love NY! But I get all mushy when I see NY through your eyes! I want to thank you also for your kind words during a most difficult time in my family. Really appriciated. Well you need to do more landscapes because this bridge is terrific and with Central Park right around the corner, there is no excuse!!! Great work recently I have enjoyed it ALL! Wonderful bridge. You may need to reconsider your idea that landscapes are not your "thing", though -- maybe they should be?